It took a heck of a lot of work, but after World War II (1939–1945) a group of artists yanked the US away from the love of “all things past” toward modern design. Many of these artists were influenced by Bauhaus artists who had emigrated to the US because of the war, such as Ludwig Mies van der Rohe (1886–1969, born Germany) and László Moholy-Nagy (1895–1946, born Hungary). Others were influenced by the prevalent European modernism of émigrés such as Finland-born father and son Eliel (1873–1950) and Eero Saarinen (1910–1961). The overriding concern of these modernist European designers was the function of architecture and utilitarian arts over ornament. They incorporated the sleek, industrial lines of modern machinery into everyday household design. The aesthetic of these designers found inspiration in the Arts and Crafts Movement of the late 1800s and early 1900s, which pioneered the integration of fine art and miscellaneous arts. Florence Knoll, née Schust, was born in Saginaw, Michigan in 1917. She showed an interest in architecture at an early age and studied at the Kingswood School in Bloomfield Hills, adjacent to the Arts and Crafts-oriented Cranbrook Academy. The close friendship she developed there with the Saarinens, who taught at Cranbrook, impacted her mature design style. Especially influential were her visits to Finland, where she met pioneering modernist architect Alvar Aalto (1898–1976). Aalto recommended that she study under the great Bauhaus architects Walter Gropius (1883–1969, born Germany) and Marcel Breuer (1892–1981, born Hungary), who were teaching at Harvard, and Mies van der Rohe, who had opened a branch of the Bauhaus in Chicago at the Illinois Institute of Technology. When she moved to New York in 1941, she met Hans Knoll (1914–1955, born Germany), who was then building a modern design company. Their marriage united two unique, progressive design minds that would revolutionize US interior, utilitarian, and furniture design that lasts to the present day. In heading the Knoll Planning Unity, Florence set the standard for modern corporate interiors that harmonized with the revolutionary International Style in architecture, which became the rage after the war until the 1970s. As part of the Planning Unity, Knoll contributed equally to furniture design and interior design. 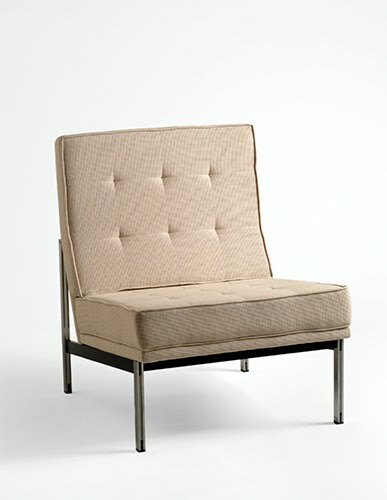 This side chair reflects primarily the influence of Mies van der Rohe’s “Barcelona” style side chairs that were omnipresent in the lobbies of all of his buildings. Knoll’s design strips away the x-bar stretchers. In many of her furniture designs, the emphasis was as much on comfort as it was on the stripped down, unornamented aesthetic of Bauhaus designers. This emphasis made her furniture infinitely more approachable to US consumers than some of the barely-essential Mies designs.